Whilst keeping our Facebook page updated with awesome content we often come across weird and wonderful guitar related items that we just have to share. Here is a collection of some awesome guitar shaped items from around the world. 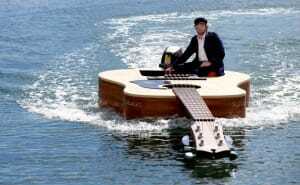 Australian singer songwriter Josh Pyke had a Guitar boat created to the specifications of his own guitar for his 2008 music video ‘Make You Happy’. The behind the scenes video below reveals all. 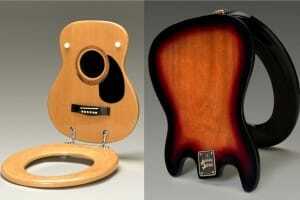 Kentucky company Jammin’ Johns are bringing ‘Music to your rear’ with their awesome guitar shaped toilet seats. Available in acoustic and electric versions, Jammin’ Johns boasts a client list including Steven Spielberg and Willie Nelson. 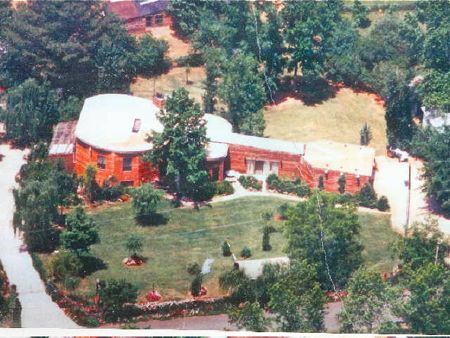 An ‘ordinary couple’ in Illinois have built something extraordinary. 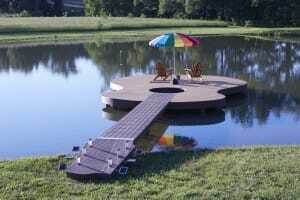 The Guitar shaped deck is a first of its kind and includes lighting pegs powered by solar powered tuners. You can even follow the landmark on Facebook! Take a look at the house on Google Maps. 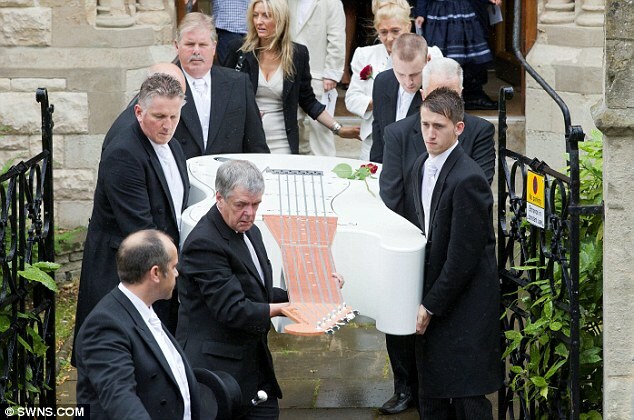 Lifelong rocker and former Ramrods guitarist John Graham was laid to rest in a 12ft long Fender Stratocaster replica back in 2012. Full story here. 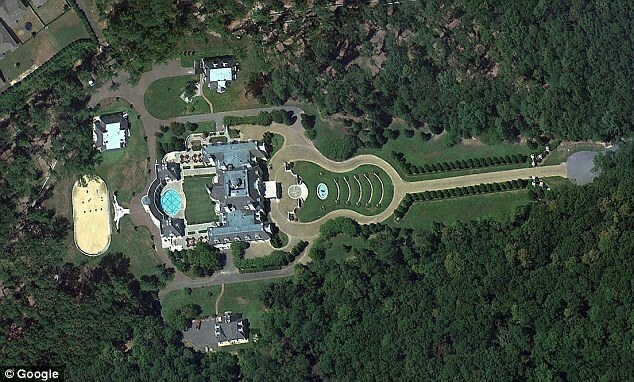 It was as though the designer anticipated the rise of Google Maps prior to creating the grounds to this mansion in Alabama. 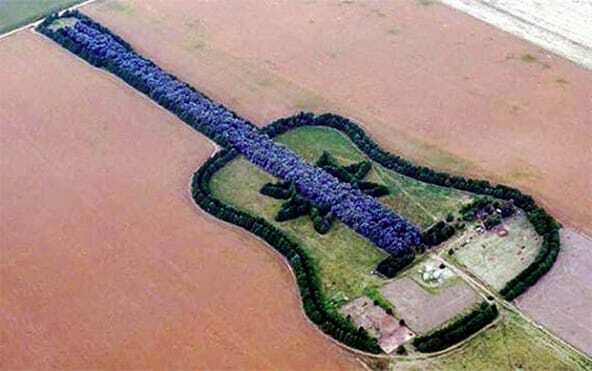 On the ground you might not notice the clever landscaping, but from a birds eye view you can’t help but notice the guitar shaped theme. Have a better look on Google Maps. A chap in Argentina has designed and planted an awe inspiring guitar shaped forest to honour his late wife. Stretching 2/3 of a mile with over 7,000 trees this truly is extraordinary. Take a look on Google Maps. 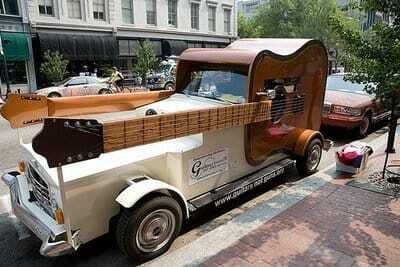 In 2004 a 1968 Ford Station Wagon was transformed into THE guitar car. The guitar shape was hand fabricated from 18 gauge steel sheets and angle iron. More info on the build can be found on the GuitarCar website. 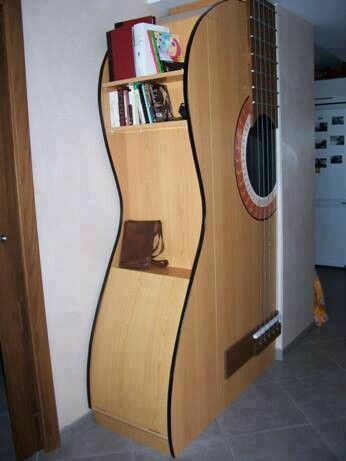 We have come across a lot of guitar shaped furniture for you to display in your guitar-centered world but this definitely beats them all. Not only does this store your favourite guitar related books, but it nearly transforms your whole room into a guitar. What could be better than that? …and you thought Guitar Hero was popular. 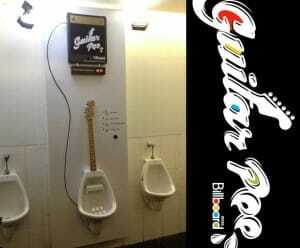 Not only does this guitar shaped urinal allow you to perform some awesome licks. It also records your MPEE3 and uploads it to the Guitar Pee App for you to listen back to. Check out the video to see it in action.